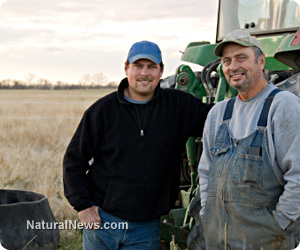 (NaturalNews) The British survey was funded by Barclays Bank and done in collaboration with Farmers Weekly. Only 15% of farmers polled said they would eat GMO food. Talk about a blanket rejection. It can't get much clearer than that. Obviously, these backward farmers want to protect their own health. Who ever heard of such a thing! How dare they! They're supposed to follow the party line. They're supposed to say, "Yum yum, give me some GM." Well, funny things happen when people consider their own bodies. They tell you what they really think. You see, 61% of the farmers said they'd grow GMO crops "if they had the opportunity." In other words, they'd willingly endanger other people's health, but not their own. Reminds me of the idea of sending government officials who declare war into the field with weapons. "No, I said the war was necessary. I didn't say I'd risk my own life out there with all those crazies running around. Besides, I suffer from migraines and my doctor told me I have to avoid stress." Or: "Everybody is hereby ordered to go on the Obamacare plan. Except those of us in the Congress who have our own plan." The farmers survey should have included the following questions, for the 61% of farmers who said they'd grow GMO crops if given the chance: "Would you eat what you sell every day of your life?" "And if not, what is wrong with you?" On a related note, we have this from Mike Adams at Natural News: "Polls were taken by accomplished scientists at the McGill Cancer Center from 118 doctors who are all experts on cancer. They asked the doctors to imagine they had cancer and to choose from six different 'experimental' therapies. These doctors not only denied chemo choices, but they said they wouldn't allow their family members to go through the process either!" Oh, and lest I forget, we have the famous vaccine proponent, Dr. Paul Offit, who said babies can handle "10,000 vaccines at once." Well, since babies have only partially developed immune systems and Offit is an adult, I'd be willing to take a crash course in how to give an injection and pop Offit with 10,000 vaccines, as a test. Why not? What could go wrong? And while I'm at it---all those clinical trials of new drugs using volunteers who don't have a clue about what they're getting into? Seems only fair to include the researchers who developed the drugs and other doctors and pharmaceutical execs as volunteers in the trials. In fact, they should be first in line. If they fall over dead or develop life-threatening conditions, then everyone else will know there's a slight problem. Moving along, if the government is spying on all of us, for our own good, and in order to protect the country, then we should spy on them for the same reasons. Let them experience their own programs up close and personal. Long ago, when funding for NSA started to accelerate into the wild blue yonder, the Congress should have offered themselves up on a platter, to set a good example. "You boys know our phone numbers, email addresses, and where we live and play. So please, spy on us 24/7, because we're about to let you do it to all Americans." No? Am I missing something here? Don't government officials endanger the nation? Haven't they already proved that over and over? Shouldn't they be watched carefully, as you would watch wild animals in a zoo? The examples keep multiplying, don't they? Oil spills, radiation leaks from nuclear reactors. Why aren't the heads of companies and governments involved, who are telling us it's all okay...why aren't they living close to the reactors and seas where it's "so safe?" What could give us greater assurance and peace of mind? What if certain government officials, who've been praising programs to fund the resurgence of inner cities, had to live in St. Louis and Detroit and experience the results/non-results of the federal programs? What if conservative legislators, who've never met a big corporation they didn't love, lived on farms where Monsanto's vaunted Roundup Ready tech isn't working at all, and the farmers have to do burn-downs, using far more toxic herbicides, to destroy the superweeds that are thriving and taking over the land? If you're a president with a Nobel Peace Prize in your pocket, and you're ordering drone strikes, wouldn't you benefit from actually being there and seeing the explosions on the ground and the bodies? At least the British farmers are being honest. Only 15% would eat GMO food. Source: GM Watch, "UK citizens reject GM food and even farmers don't want to eat it"